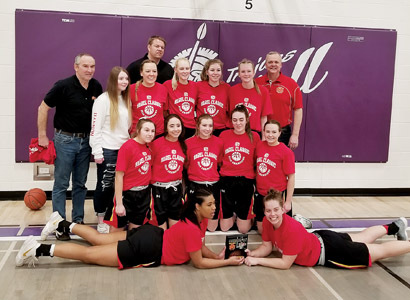 W.R. Myers Rebels varsity girls basketball team got a mark of revenge in its championship run at the Rebels Classic this past weekend. The Rebels were able to beat Wetaskiwin, the team that won the Rebel Classic last year, 76-65, thanks to building a 19-point lead heading into the final quarter. Kitawna Sparks had 15 points to go with 13 rebounds in the victory. Austen Robbins also had 15 points. Sophie Simek hit for 13 points. Dani Wright hauled in 10 rebounds. The Rebels kicked off its tournament run with a dominating 74-25 victory over Vauxhall Queens on Friday. “Everyone got on the scoresheet. We came out very strong and were able to build quite a sizable lead by the half. We were able to substitute quite frequently, and we were able to keep the pressure on and never let the Queens get back into the game,” said Wood. Anika Steed had the double double of 10 points and 10 assists. Simek also hit for 10 points. Rebels girls made their way to the championship final in Saturday with a big 85-60 win over Bowness Trojans. A two-point lead after the first quarter, became a 17-point lead at half. “Started off a bit slow defensively, but really clamped down in the second quarter, only allowing seven points. The girls played extremely hard in the fourth and put 27 points up in the final quarter which put the game out of reach,” said Wood. Sparks poured in 30 points to go with 14 rebounds. Robbins contributed 12 points. Wright had the double double of 10 points and 10 rebounds. Steed also scored 10 points. W.R. Myers Rebels varsity girls basketball team returns to league competition today, with a home game against Magrath Pandas. Junior varsity is at 6 p.m. with varsity to follow at 7:45 p.m. The team then hits the road on Saturday for a game against Catholic Central Cougars.